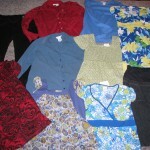 DanaSchmoyer.com » Blog Archive » Maternity Bargains! 29 Jan 2009 Maternity Bargains! I have been looking at Target, Wal-Mart and K-Mart for maternity clothes and if there was anything cute and that fit that was less than $5 I would get it. I figured I’d rather buy stuff on sale little by little as I find it instead of needing to go out and buy whatever is out there when I really need the clothes. Today I made an exception and went out to purposefully find things. My belly started to stick out a little this week. Tuesday I took an afternoon subbing job and was told to dress warm because I would be outside for about 30 minutes of the day. I wore my corduroys and leggings underneath, and man was it tight! I was so uncomfortable and decided for Wednesday when I subbed that I would wear something loose. So I wore a long sleeve maternity shirt I got from a friend and my jeans (with leggings again) and I was totally uncomfortable all day long! I was exhausted after a long day yesterday and didn’t get a substitute teaching job for today so I took advantage of enjoying the morning around the house and spent the afternoon shopping for maternity clothes. Some people at school told me that I should check out the Klothes Kloset, a second hand store in town, to see what kind of maternity clothes I could find, and I’m glad I did! This is what I got from the Klothes Kloset. 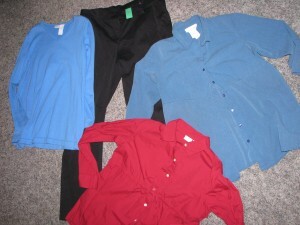 A pair of black dress slacks for $1, a blue sweater for $4, a blue dress shirt for $3.50 and the red dress shirt for $4. 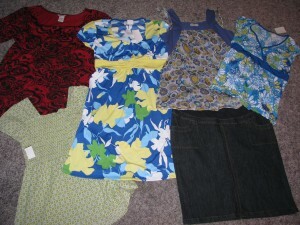 A total of $12.50 for 4 articles of clothing! After this I decided to check out the department store in town, Herbergers, to see if they had any good sales, and yes they did! They have a yellow dot sale, which any items with a yellow dot (on the price tag) were ridiculously marked down, their summer items to $2.99! Here’s my great buys from Herbergers! The red and black shirt was $8, Green shirt below $2.99, blue and yellow dress $2.99, purple sleeveless $2.99, denim skirt $8 and blue flower shirt $2.99. A total of $27.96. When I got home I checked out the original prices on the items I bought at Herbergers, and it totaled $233! Wow I was shocked! That means I saved 88% on the clothes I bought at Herbergers! 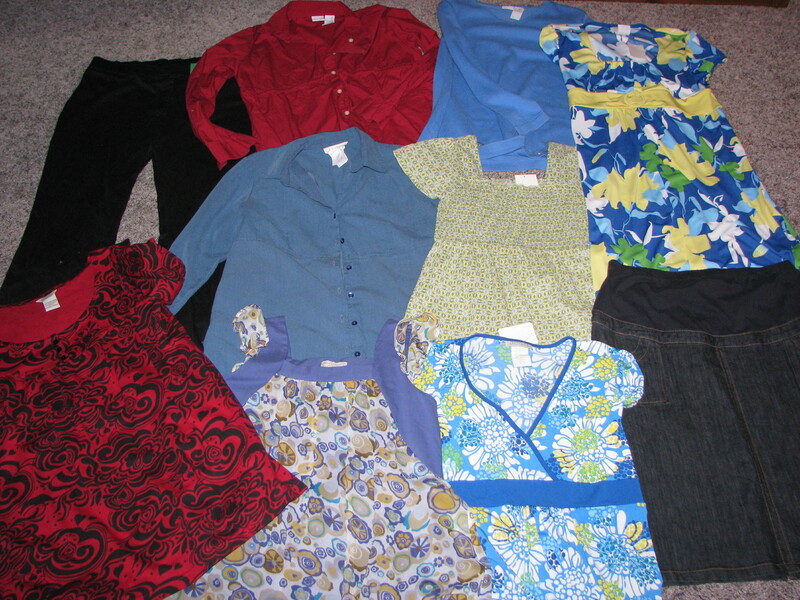 Total over all today I spent $39.46 for 10 pieces of clothing, averaging less than $4 each piece. Even though I did splurge and spent $8 on 2 items I really didn’t want to leave at the store. So now I have 17 maternity items in my closet. One from a friend in a bag of clothes she let me dig through and she also found me $1 capris from Target. My parents got me 2 shirts when Tim and I were down in Texas, one for a Christmas gift and one I found for $4 at JCPenny in their town. I found a cute black dress at Target for less than $5 and at K-Mart I found some comfy shorts for $5 and a t-shirt for $3. I will still need to buy some jeans and other pants later on and maybe a couple more tshirts. One of my small group girls said she would see if her Mom has anything she can give me, so I’ll wait and see if anyone has something to donate to me, and then just wait until I really need anything else before making any purchases. Great job!! I hated buying maternity clothes because they were so expensive. (that was before I knew about saving!) Those tops are super cute! That’s awesome. It’s so hard to spend so much money on stuff you really only wear for 6 months!